The party invitations for my daughter’s Charlie and the Chocolate Factory birthday party were made to resemble the golden tickets from the story. The tickets were tricky to make. I had difficulty finding just the right type of paper, gold with a shimmer but could also be used in an inkjet printer. Originally I was going to print them at Staples, but they didn’t have any paper that looked the way I wanted. The paper I used was found at an online paper company, Paper Garden. The two sided printing also took a bit of work to line up correctly, but in the end I was happy with the results. 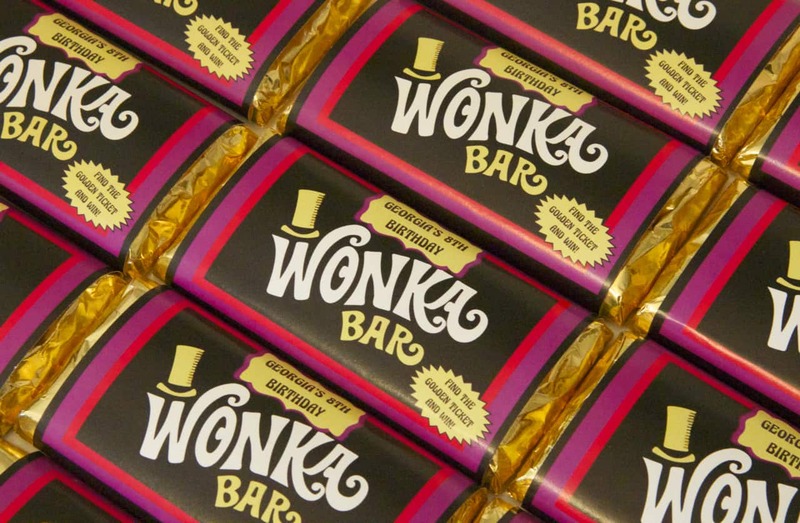 I used Caramilk bars with the gold foil wrapper to hide the golden tickets in. The wrappers for the chocolate bars were made in Adobe Illustrator. I used the original wrapper from the chocolate bar to get the measurements for the size I needed. I sent the file Staples to print the sheets and used my Zing to cut them out. The invitations turned out better than expected. All but one of the golden tickets made it home with the kids. One of her friends was more excited about the chocolate bar. He gobbled it down and threw out the golden ticket LOL! This post contains affiliate links. Meaning, that if you make a purchase through my links, I will earn a small commission for it at no additional cost to you. Thank you for your support of this site.